For what Sohaila Danish and her compatriots have posted on the Internet, they could lose their hands. After all, summary amputation is the sort of punishment readily meted out by Afghanistan's Taliban sect, the fundamentalist Islamic group that controls much of the country. While the world has focused its humanitarian and media attention on other conflicts, the Taliban regime has quietly earned itself a reputation that would make Pol Pot proud, inflicting on the citizenry extraordinary levels of brutality and oppression. The Taliban has lopped off the hands of petty thieves, killed political opponents, stoned adulterers, and treated women with particular enmity, restricting their education and attire, and forcing them to live as fifth-class citizens. Enter the Revolutionary Association of the Women of Afghanistan, a group devoted to fighting for the human rights of the country's people. RAWA has turned the Web into a weapon for social justice. "Our site," says Danish, "is like a dart in the heart of the misogynist Islamic fundamentalists." That dart has become a primary tool for raising funds and circulating the group's message. In fact, says Danish, the Web is integral to RAWA's success, providing a forum where one hadn't existed previously. "Without the Web, it would have been most difficult for us to make ourselves seen and heard," she explains. "It has had a liberating effect on us." 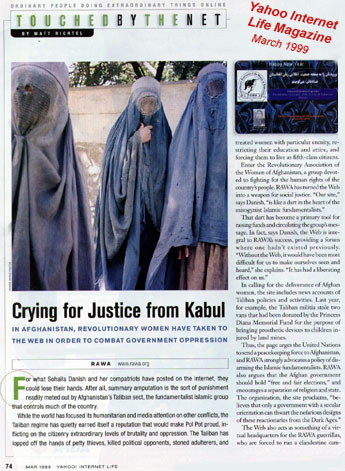 In calling for the deliverance of Afghan women, the site includes news accounts of Taliban policies and activities. Last year, for example, the Taliban militia stole two vans that had been donated by the Princess Diana Memorial Fund for the purpose of bringing prosthetic devices to children injured by land mines. Thus, the page urges the United Nations to send a peacekeeping force to Afghanistan, and RAWA strongly advocates a policy of disarming the Islamic fundamentalists. RAWA also argues that the Afghan government should hold "free and fair elections," and encourages a separation of religion and state. The organization, the site proclaims, "believes that only a government with a secular orientation can thwart the nefarious designs of these reactionaries from the Dark Ages." The Web also acts as something of a virtual headquarters for the RAWA guerrillas, who are forced to run a clandestine campaign. Fearing an unannounced visit from gun-toting Taliban operatives, RAWA has no official office. Indeed, the group's mailing address is a post-office box in Pakistan. RAWA launched its site three years ago, when members taught themselves to use HTML. But the group itself has been around since 1977, founded by female Afghan intellectuals led by a revolutionary named Meena. According to the site, the "martyred leader" was assassinated 10 years later by KGB agents and their fundamentalist accomplices. Danish says the Web page receives about 150 visitors and five to 10 e-mail messages daily, as well as periodic donations of clothing and food from other women's organizations. The site has also felt the ire of the Taliban and its supporters, who once published a counterfeit RAWA site that included pornographic pictures. "They would love to see the end of our site," says Danish, noting that even the location of her Web server is a secret. "But this is fortunately beyond their means."